The number of tuners your Tablo has dictates its capabilities. Watching or recording a single live program requires a single tuner. Watching a recorded program does not require a tuner. Watching a recorded program streamed to a device away from your Tablo's home network requires a tuner. Now that you understand what activities require a tuner, it's easy to do some 'tuner math'. For example, on a two tuner model, you could watch a show live while recording another. Or if you're stuck waiting in the doctor's office, you can set a show to record and watch a show on your tablet that you've recorded earlier. On a four tuner model, someone can be watching the football game on the big screen, while another person watches a movie on a tablet all while recording two other live shows. The 2 tuner can be ordered through Newegg for only $199. The 4 tuner is $299. This is pretty comparable to TiVo's pricing for the actual box. Keep in mind, you really only need 1 Tablo for your house. You'll need a TiVo or TiVo Mini at every TV. Where Tablo really becomes impressive is the monthly fees. The first thing to keep in mind is that it can work without paying anything additional per month. You'll see a reduced feature set (1 day guide data, etc), but it will work. The premium plan runs $4.99/month, $49.99/year, or you can purchase a lifetime subscription for $149.99. Subscriptions are tied to your account and not the device, so you can add as many Tablos as you'd like or change your Tablo unit at any time. If you want more details on what is included in the free vs paid, click here. With TiVo, I pay $240/year. With Tablo, I'd pay $50/year. This all sounds great, but how does it work? The Tablo box included the actual device, a power supply, and an ethernet cable. One thing to keep in mine is that since Tablo doesn't connect directly to a TV, you can put it anywhere in your home. I highly recommend putting it on wired ethernet if possible. I unboxed the device and plugged up my antenna, my USB hard drive, the power cord, and the ethernet cable. I then fired up the iPad app and it discovered the device rather quickly. 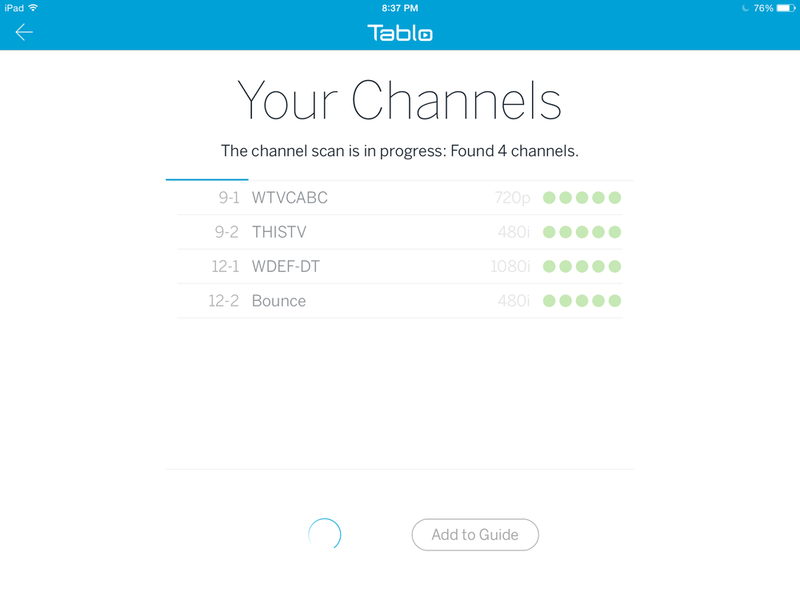 I had 1 software update to run and then the Tablo ran a channel scan to determine what channels I could get. It then went to work formatting the drive. The software was explicit that the drive had to be formatted to work with Tablo and asked me to confirm that I was okay with that. While formatting was taking place, the guide data was also downloaded. Scheduling records couldn't be easier. 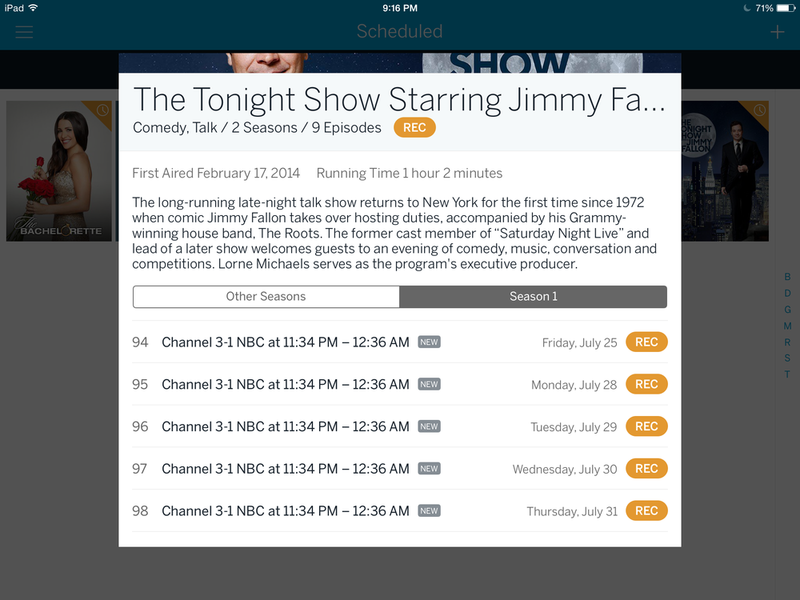 You can browse a nice list of show types: Prime Time, TV Shows, Movies, and Sports. The search feature works well and it shows full artwork for most shows. 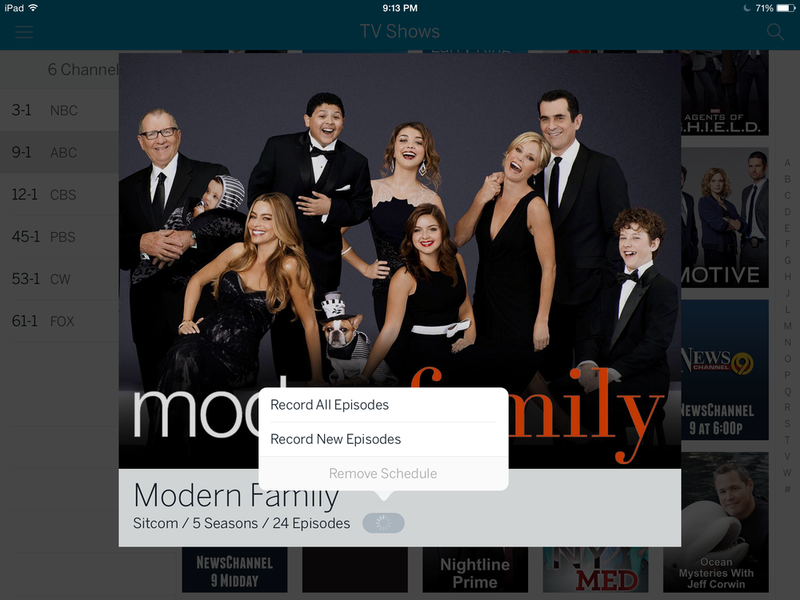 When you want to schedule a recording, you hit the record icon and can select all episodes or just new episodes. Live TV works as expected. I spent Saturday morning out on the porch watching the morning news live on my iPad. Is there anything about Tablo I don't like? My only complaint is that launching a live TV channel takes longer than I would like. I'm guessing that it's caching a few seconds of content ahead of time to allow for uninterrupted watching. I've got a USB 3.0 hard drive attached along with wired ethernet, so I know it is nothing with my network. We mainly watch content that has been recorded and it loads extremely fast (similar to Plex or Netflix). It just so happens that while testing the Tablo, my TiVo died during a software update. Although they are sending me a new one, I'm probably not going to open it. It's likely going to go on Amazon, and I'll be switching to Tablo for my OTA content and DVR functionality. It fits into my Roku based ecosystem, it's 75% less on a monthly basis (and even more if you pay annually), and it's drastically simpler. TiVo feels like a sledgehammer when I only need a rubber mallet. I don't need my DVR to play Netflix or YouTube. I have the Roku for that. I just simply need my DVR to give me my shows regardless of whether I am on my Roku or my iPad. If I want to watch my TiVo recordings on my iPad, it requires yet another box. 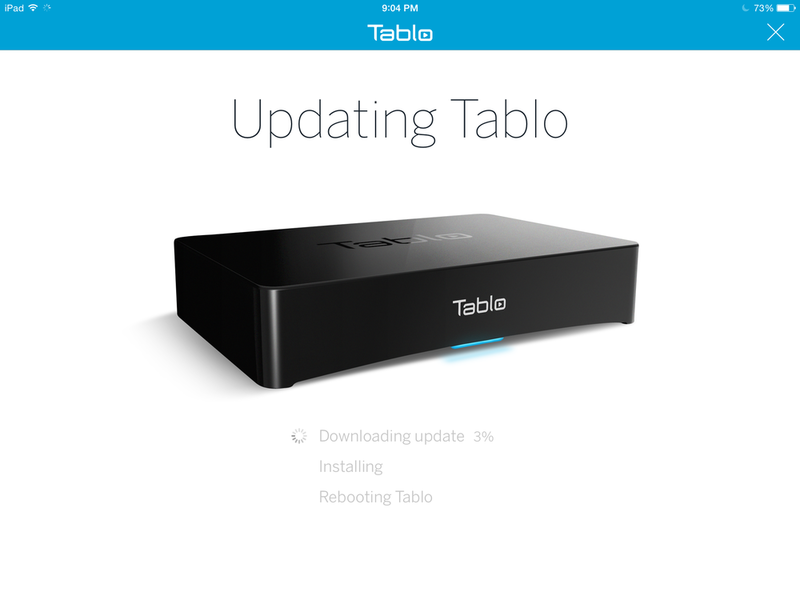 If you are looking for a simple DVR solution for OTA content, Tablo is a great choice. If you are an Apple TV customer, you'll be glad to know that it supports AirPlay from your iPad.